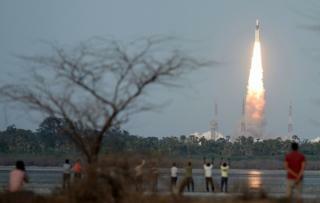 India's space agency has successfully launched its heaviest rocket. The 640-tonne rocket blasted off from a launching site off the Bay of Bengal in Sriharikota. As one website put it, "it's been a big day for India". The rocket will reduce the Indian Space Research Organisation's (Isro) reliance on European vehicles to launch heavy satellites. The coverage of the launch has been euphoric, and often colourful, with websites comparing the rocket to the weight of 200 elephants, or five jumbo jets. Such comparisons highlight the importance of the launch for the country, which is aggressively competing to get a bigger share of the global commercial satellite launch market. India has so far relied on other countries to send heavy satellites into space, which is expensive and a drain on Isro's budget. The GSLV Mark III can carry put a payload weighing more than three tonnes into the high altitude orbit occupied by the spacecraft that relay TV, telephone calls and broadband connections. But it's far from being the world's heaviest rocket because Nasa's Saturn V, which was used between 1967 and 1973, still holds that record, with total mass at lift-off about four times that of India's GSLV Mark III. The NDTV website says the rocket is as heavy as five Jumbo jets. And the weight matters because communication satellites are quite heavy. Experts say the rocket gives India more flexibility in launching different kinds of satellites. "We were able to send [satellites weighing] up to two tonnes previously. This is a double quantum jump for India," Ajay Lele from the Institute for Defence Studies and Analyses told the AFP news agency. Isro hopes that the rocket, called the "monster" by one newspaper, will be able to carry an astronaut to space by 2024. India wants to become the fourth country after the US, China and Russia to send a person into space. Experts say the successful launch will give impetus to India's indigenous space programme. The launch follows Isro's other recent achievements, including a mission to Mars, and the launch of more than 100 satellites in a single mission earlier in the year. In the spirit of finding fun facts, the BBC also did some research on the height of the rocket and found that it's taller than the Statue of Liberty. The rocket is 43m (141ft) tall, while the statue stands at 33.83m, minus the pedestal foundation.